It is a known fact that jeans will never run out of style. They have been around for decades and have shown that they are able to fit any person. Also, they can be worn in different styles like casual, semi-formal, and smart casual. Additionally, they can be paired with any fitted and loose tops, either with or without sleeves and cover-ups. Likewise, women can also wear them with any types of shoes, whether sandals, high heels, rubber shoes, sneakers, and slippers. Since jeans come in different cuts and styles, women of all body types can surely stand out when wearing them. They can actually find the best jeans for big thighs, wide hips, and anything else. However, they should also know how to carefully select the one that suits them. The first thing to do before buying any jeans is to take the proper measurement of the body. A good pair of jeans is the one that is not too loose and too tight. The first thing to measure is the waist. Basically, it is the smallest part of the upper body or torso. It should be remembered that a person’s waistline is not always the right size to buy. Such will depend on the waist level of the jeans. For example, if the person buys a high-waist product, the waistline will be a perfect size but it she buys a low-rise one, the size should be at least one or two measurements higher. Buyers should also measure the widest part of their waist. Inseam measurements are also important in order to determine the right length of jeans to buy. As mentioned above, there are a lot of cuts or styles of jeans. People should also be familiar with such because some styles will work for a certain body type and size and some will not. The boot cut type is the one that perfectly fits onto the thighs and flares from the knees. The good thing about this style is that it can be worn by women are lean and curvaceous, as well as those who have round tummies or bellies. The style called straight is the one that has the same measurement from thighs to ankles. The product is designed to help elongate a person’s legs. It is best worn by women who have shoulders that are wider than their hips. Skinny types, on the other hand, can work with any body types. The only best advice is that people should choose the color that will enhance the beauty of their shape. 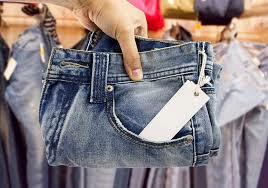 The rising style of the jeans is also an important factor to look into when buying a pair. The high-rise or high-waist jeans are the ones wherein the highest part of the product rests on at least 9.5 inches above the person’s navel. This is perfect for people who have small waists. They can also be used by individuals who want to camouflage their big bellies or tummies. The low-rise or low-waist jeans, on the other hand, are the ones that suit women who have flat tummies since the highest part of the item rest at a maximum of two inches above the navel.